I love to read blog posts about new makeup and monthly favorites, but to be honest, nothing is more informative for me than the holy grail-type post, the post that tells me what a person who loves makeup as much as I do keeps returning to day after day. So I thought it would be fun to do a series on the staples in my collection, the favorites that I’ve had for awhile and return to again and again despite all the new releases and Ulta and Sephora hauls. 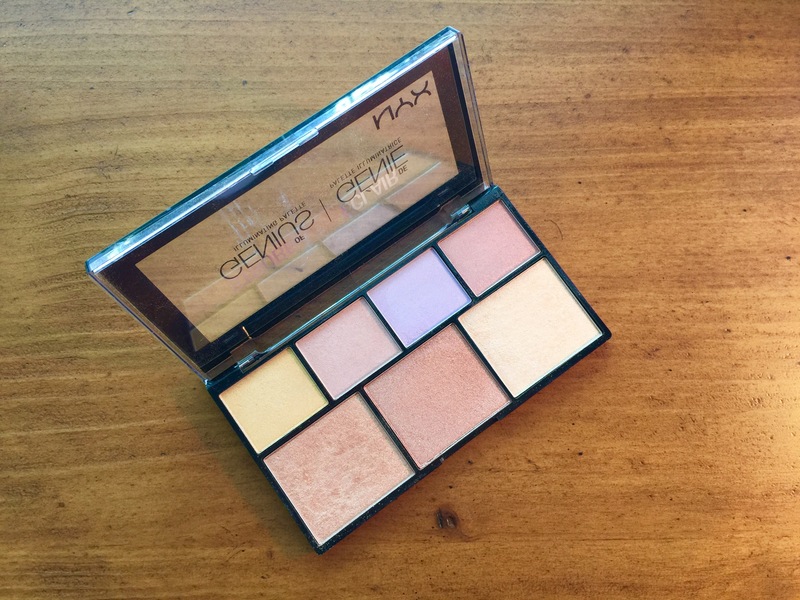 I’m going to kick it off with the first highlighter I ever bought, the first product whose release date I followed and that I tracked down the minute it hit stores, the NYX Strobe of Genius Illuminating Palette. 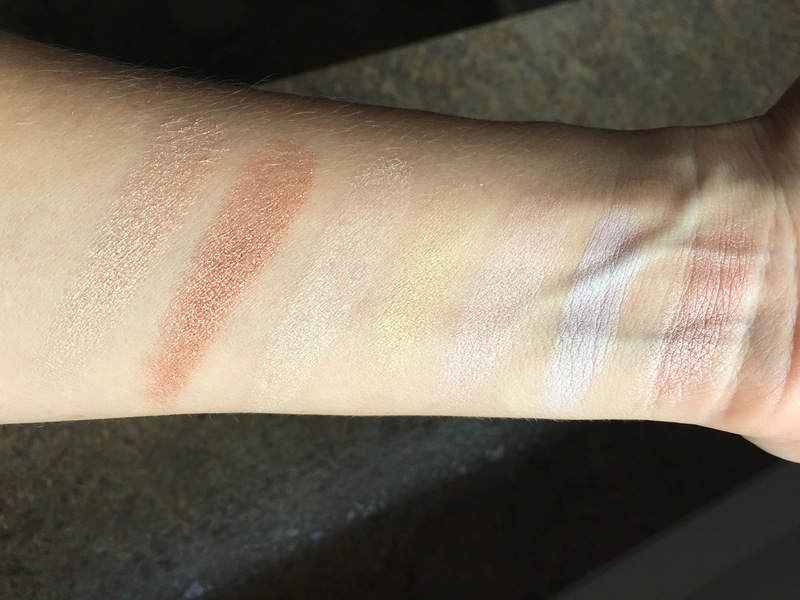 Here are the swatches, left to right, bottom row then top row, in natural light. 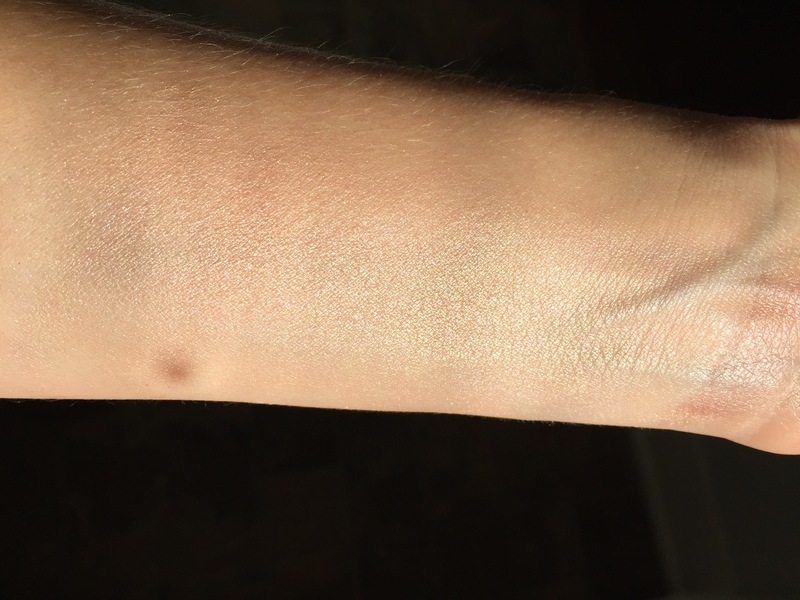 Keep in mind that these will obviously sheer out on your skin–I’ve swatched them quite heavily here. As you can see, there’s great variety in this palette, and I often use a couple different shades on different parts of my face. The first, third, and fifth shades (starting from the left) are my favorite cheekbone highlights, and I like to use the second shade on the perimeter of my forehead or to top a matte bronzer (or, as I mentioned, as an eyeshadow). The gold shade is the stiffest of the bunch, but this keep it from being too gold on your face–it actually works quite nicely. When you look toward the right, you can see echoes of Anastasia Beverly Hills Moon Child Glow Kit with the lavender and pale pink. If that’s a palette you’ve been lusting after but you don’t think you’d wear all of the shades, this might be a good option for you. The options in this palette is what truly makes it one of the staples of my collection. No matter what makeup look I’m wearing or how pale or deep my skin tone is in a particular season, this palette has me covered. If I’m traveling and want to bring a matte eyeshadow palette, this will give me some shimmer shades to work in so I don’t have to bring a second eyeshadow palette. All of the shades (except the gold) are creamy and pigmented, and sheer out evenly on the skin. I have a ton of highlighters, but this is easily my favorite. I thought that was awesome, too! I am going to use it this way more often!